Sharon Danks, a Berkeley-area environmental planner, shows off a pond at Rosa Parks Elementary to children at the school. Danks and her firm have created green schoolyards that often include gardens and outdoor classroom spaces. 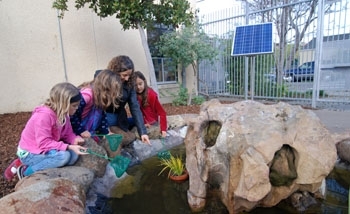 While elementary school students usually spend recess in yards with endless asphalt and harsh metal structures, children in any schoolyard designed by Berkeley-based environmental planner Sharon Danks instead play in blooming gardens, shaded ponds and nature trails. "We're trying to put the idea of exploration and challenge and wonder back into an environment that they spend all their time in, and that's the schoolyard," she said. Danks and her firm, Bay Tree Design, have been working with Bay Area school districts to create green schoolyards, boasting features like outdoor classroom spaces, greenhouses, edible vegetable gardens and composting bins. These playgrounds, which allow students to understand natural processes in a way that urbanized landscapes prevent, have been gaining popularity across the nation as more organic forms of instruction. "A green schoolyard ... allows the teachers to teach their classes outside, to provide play environment that is richer than the traditional one - that has creative play and active play balanced, and one that reflects local ecology in a number of ways," she said. "Around here, it usually means having less asphalt." For the past several years, Danks has been working on designing green schoolyards in the San Francisco Unified School District - where 15 elementary school yards have been completed and 29 are in the works - as part of the district's Proposition A bond program, composed of two local school bonds passed in 2003 and 2006 to improve district facilities. A chunk of that money has been designated to making schoolyards more eco-friendly, which is where Danks comes in. "We aim to serve children and parents and communities of schools in (the district) to help them transform their school yards into more vibrant learning environments, so basically, taking asphalt yards and making them vibrant outdoor classrooms," said Rachel Pringle, programs manager for the non-profit, San Francisco Green Schoolyard Alliance, that works with the school district. Much of the district's plans for making their schoolyards more eco-centric, according to Pringle, came from Danks, who has been pushing for more green space in schools for the past ten years. In 2000, she completed her joint master's degree in landscape architecture and city planning at UC Berkeley's College of Environmental Design, and after receiving a Geraldine Knight Scott Travelling Fellowship, she explored innovative schoolyards - the subject of her master's thesis - around Europe. She said each region she visited has its own speciality when it comes to schoolyard designs, and California's is school gardens. But there is more to a green schoolyard than just a garden. Danks also emphasized making schoolyards more comfortable and usable by planting more trees for shade, creating barriers that allow different kinds of activities, growing edible gardens, tailoring playground equipment to different age levels and facilitating outdoor classrooms and art projects. And with this long list of goals comes a long list of benefits - a more balanced play environment, increased familiarity with ecology, improved teaching quality and a community's ability to "reclaim its public space" that has been given to a school district. "What we're doing is re-empowering the community at the school to be the stewards of their own backyard," she said. She also works as a volunteer at Rosa Parks Elementary School in the Berkeley Unified School District, where solar panels teach students about renewable energy and an edible garden familiarizes them with seasonal changes and gardening. "It makes recess much more interesting for the students, and it encourages a lot of imaginative play with the kids ... and it also makes for a beautiful campus," said Paco Furlan, principal of the school. "Students are able to do hands-on science with our pond and with our garden and also with the living plants that we have around campus." In November, Danks published a book showcasing her knowledge about green schoolyards called "Asphalt to Ecosystems," which also has pictures from many of the 200 schools she has visited in eight countries. After the schoolyards in San Francisco are completed in June, Danks will also host an international conference in the Bay Area for green schoolyard planners to "cross-pollinate," she said. "Kids grow up to think about the world in the way they experience it," she said. "Why should we accept clay and asphalt and boring environments for our kids when we could have something else?"